To help us understand the complexities of nature, we often use simple classifications to help wrap our minds various intricacies. Think about how we classify species interactions: predation, mutualisms, parasitisms, commensalisms, etc. Simple. But complications linger in the background. Former NCSU PhD student Stephanie Archer (along with current student Enie Hensel) demonstrated one such complexity in a recent study (full article summary pasted below). 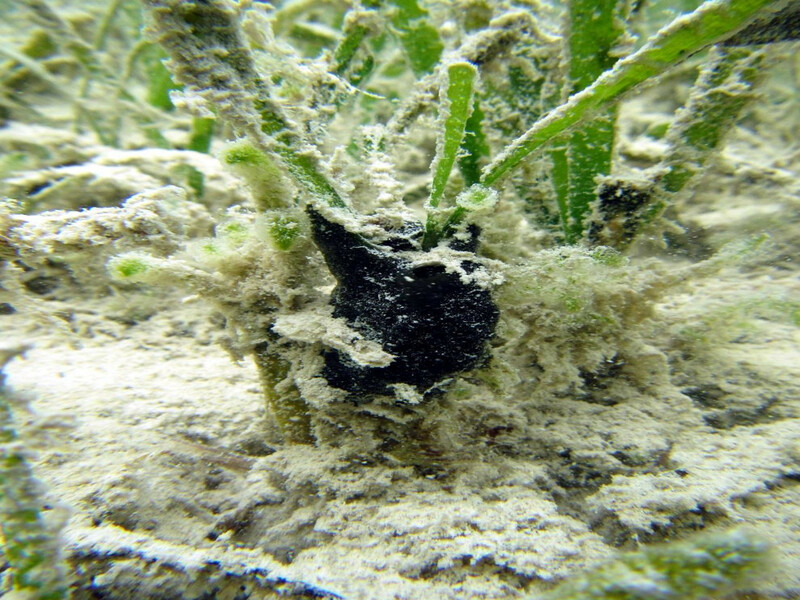 A small sponge can often be found growing around seagrass blades in The Bahamas (see photo above). In typical situations, the relationship is commensal (neutral) – the sponge gets an attachment site, whereas the seagrass blade is shaded (reducing photosynthesis) yet gains nutrients from the sponge. All are happy. But in systems where humans add nutrients, the situation changes. The seagrass no longer needs nutrients from the sponge and the shading becomes a net negative. Thus, the relationship becomes parasitic. Such shifts in species interactions show how subtle human impacts can harm organisms (even if it doesnt lead to organism death). So Mr. Sponge, I am breaking up with you – you are no longer needed in my life. Nutrient loading is a common human impact in coastal habitats which is driving significant losses of seagrass habitat worldwide. 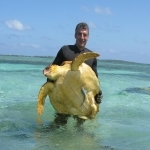 This is concerning, as seagrass beds provide numerous ecosystem services. Although nutrient loading can result in eutrophication and mass mortality of seagrasses, it more often results in subtle alterations of abiotic conditions which, by themselves, are insufficient to drive widespread seagrass mortality. Here we used a month-long field-based experiment to test the influence of anthropogenic nutrient loading on the outcome of an interaction between an epizootic sponge (Halichondria melanadocia) and a seagrass (Thalassia testudinum). Using a factorial design we manipulated ambient nutrient concentrations by adding fertilizer to plots with and without a sponge in a relatively pristine seagrass bed on Abaco Island, The Bahamas. We measured seagrass growth, below- and above-ground biomass, and the change in shoot density. We found that low levels of nutrient loading (i.e., insufficient to cause increased algal growth and decreased oxygen levels associated with eutrophication) resulted in a non-significant increase in seagrass growth, biomass, and shoot density when a sponge was absent. When a sponge was present, the same level of fertilization resulted in a significant reduction in the response variables. Our results show that anthropogenic nutrient loading can shift the sponge-seagrass interaction away from commensalism toward an interaction that has negative consequences for the seagrass. Additionally, a shift in the outcome of this context-dependent interaction can alter the impact of nutrient loading on seagrass productivity. Our study provides an example of how simple classifications of interspecific interactions (e.g., commensalism) often mask underlying variability. Characterizing the mechanisms driving the variability will allow us to understand when and how the outcome of an interaction will change. Ultimately, this will allow us to better predict how human activities will indirectly impact various ecosystem functions.